Some of you may know that I have recently joined twitter. For all those technological whizz-kids out there, I actually find it quite laughable that I am on this. I was thinking about it this morning that for someone that says they have no idea about technology I have a blog, a twitter account, facebook, 1 work email address, 1 normal email address, a google reader account and subscribed to a whole bunch of blogs. Plus I have a smart phone. How generation ‘dot com’ am I? So maybe I’m in denial. Maybe I’m a little bit better at technology than what I first thought. Now before I get too big for my boots, I should probably tell you that I just do a lot of Googling. There is a lot of ‘how does blah blah blah work?’, ‘what does blah blah blah mean?’, ‘who is the blah blah blah of blah blah?’. I don’t want to mislead you all into believing that I am crash hot at the computer, I’m happy to confess that I don’t know a lot, I just mighty good at asking even the dumbest questions. Last week I even asked google ‘is there such a thing as invisible fish?’ (For your information – it was a yes!). This week my question to Professor Google has been ‘What are floating islands?’. After the Pacific Island forum in New Zealand two weeks ago, Anote Tong announced on the opening day that he was considering the possibility of building floating islands in order to keep Kiribati people in their homelands and not ‘climate change refugees’. This suggestion has been reported as being ‘strange’ and ‘drastic’ but it certainly straightened the backs of all the leaders at the forum. So this floating island thing. What is it? Well from what I can gather, these floating islands are made up of sand, plants and rock. I know that the Palm Jumeirah island in Dubai has 10 metre deep dredges into the sand that were pretty much used as the base for their creating of the island. Check out this little clip I found…. I suppose the best way to go about it would be to transfer sand with dredges but also Kiribati has a lot of marine life that I’m assuming would be majorly interrupted. In a previous post, I’ve spoken about Greg Stone and his successful campaign to get the Pheonix Islands waters (part of the Kiribati group) listed as a world heritage area due to its wonderful but threatened marine life. I’m guessing we can’t move that sand can we? To be honest, I’m not even too sure how this whole project could actually happen. I think you would need a hell of a lot of rock to break up the ocean, huge sand movers (Dubai used 13 to create their latest group of islands), lots of sand and of course a small bucket load of money. Ban Ki-moon has been fantastic in drawing attention to the fact that Kiribati needs to start looking at viable options but also that they haven’t been able to gain access to a lot of money that was promised to them at the Climate Change Summit or the recent money that Europe have pledged to them. In his presentation at the forum, Tong estimated that to build a floating island would cost approximately $2 billion. The Palm island in Dubai cost around $24 billion but then again Dubai is a rich country. This 2 billion would have to come from other countries/UN/World Bank. Yes that may be annoying but then again would countries like Australia prefer to contribute to them staying in Kiribati or having to deal with Kiribati residents when they coming knocking on the door as ‘climate change refugees’? Yeah this is a complex issue. As I am still at home in the country I came across this picture that my Dad had taken in 1979. 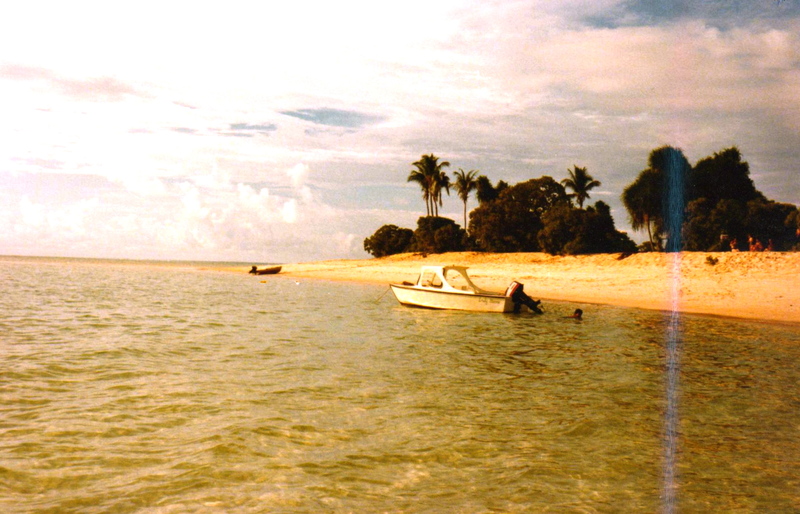 This island was called Bikeman and was situated in the middle of the lagoon in Tarawa. In the mid 80’s this island was washed away and now does not exist. One day it’s here. 15 years later it’s not. Had you asked the real Professor Googol, he would have revealed that a floating island is a round boat covered with grass and a green and anchored in Lake Couer D’Alene, Idaho…sometimes it’s a par 3, other times, par 4, depending on where the anchor is located.